Newport is most likely your go-to spot in the summer months for its stunning coastline, tasty eateries, and lively entertainment, but it should be a must-visit in the off-season as well. Without the usual droves of tourists, you can easily find a parking spot as well as score that dinner reservation you always wanted. There’s nothing better than having a hot toddy or meal hearthside on a winter day. Overlooking the harbor, every table at 22 Bowens comes with spectacular views. Nab one of the four tables that flank the upstairs fireplace for an extra toasty experience. Castle Hill Inn serves up house-made pasta and Nantucket Bay scallops inside the nineteenth-century Victorian mansion overlooking two wood-burning fireplaces, in addition to the ones featured in the lobby and mansion bar. The White Horse Tavern, America’s oldest tavern, plays up the cozy atmosphere within the uber-quaint colonial building that it calls home, with multiple fireplaces to warm you while feasting on comfort food like beef Wellington and lobster mac n’ cheese. The old-world charm of the Clarke Cooke House features a gas-burning fireplace in its wharf-level Candy Store, while the bistro bar room, decked out with wood posts and beams, has a wood-burning one alongside a cozy couch you’ll want to snag if available. The Mooring Seafood Kitchen + Bar offers seafood lovers waterfront views along with their shellfish towers, and a few tables by a wood-burning fireplace that stays lit all season long. 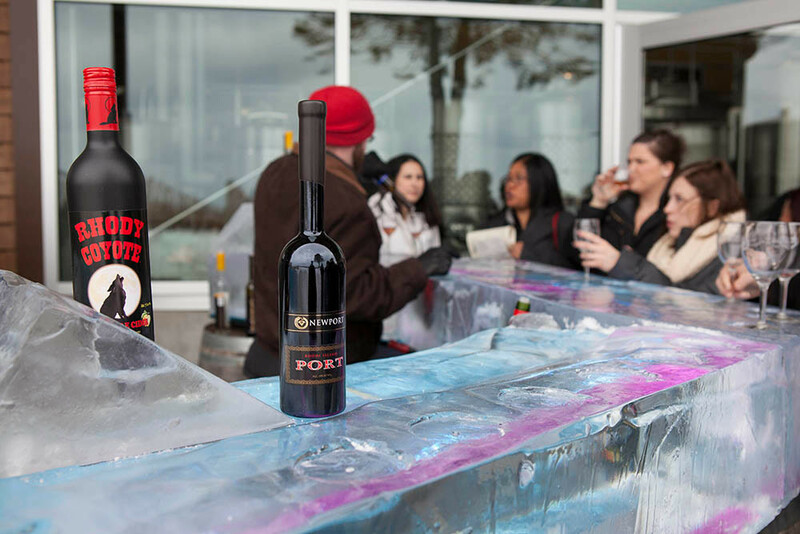 When you can’t take another day sitting inside, head to Newport’s 30th annual Winter Festival. The fun-filled, ten-day festival, from February 16 to 26, caters to all ages and features food, music, and 150 events that are held at multiple locations in and near town. Some of this year’s events include a princess party, a concert by Jimmy Buffett tribute band Latitudes, comedy shows, a chili cook-off, a hot drink contest, and two polo matches held on Easton’s Beach. Work out those cold-weather kinks and spend a few hours at Bodhi Spa, New England’s only hydrotherapy day spa, which specializes in a rejuvenating water journey treatment to boost the circulatory system and get rid of toxins. The hot-cool treatment alternates hot mineral baths, cold plunge pools, wet and dry saunas, and a steam room, all for $55, which also gets you access for the entire day. Newport has its share of intimate live music venues and often brings in some big-name acts. On Fridays and Saturdays, Newport Blues Café hosts live bands from all different genres starting at 10pm. Check out a slightly more intimate live music scene while you sip the extensive craft beer and wine selection at Norey’s, which hosts performances on Wednesday nights and live jazz on Thursdays throughout the season. Play a game of pool at popular local hangout Jimmy’s Saloon, which also features live local bands on certain nights. Open year-round for tastings and tours, Newport Vineyards offers visitors a behind-the-scenes look at the wine-making process. You can sip on wines by the glass or at one of their tastings, and, if you’re hungry, feast on duck confit pizzas, local oysters, and roasted chicken at their in-house restaurant, Brix. During the winter months, you can find wine and cheese classes, cooking demonstrations, and live music on the weekends. Newport Storm Brewery, Rhode Island’s first microbrewery, offers self-guided tours, beer flights, and tastings of Thomas Tew Rum, named after the infamous Newport pirate. Spend the afternoon at The Newport Car Museum, the newest museum on Aquidneck Island, located in nearby Portsmouth, where you can view a private collection of 60 cars on display including classic Corvettes, Lamborghinis, and Ford Mustangs that span over six decades. Recently named one of the country’s 10 Best New Attractions for 2017 by USA Today, the museum’s walls are adorned with photographs and interactive displays, making it feel like more of an art museum. There are also six racetrack simulators and an impressive collection of mid-century furniture. Unleash your inner Dorothy Hamill and sign up for an ice skating lesson. Island Skating Academy offers adult classes throughout the week ($25 for 30 minutes) at multiple locations on Aquidneck Island. If you already know your way around a rink, the Newport Skating Center has public skate times for all ages and adult skating after 9pm.